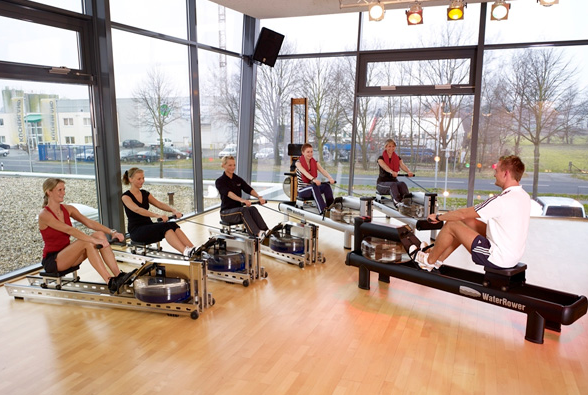 Exercising on a rowing machine is one of the most efficient and effective forms of exercise one can do. No matter what a person’s age, regular aerobic exercise is important and using a rowing machine is a great way to get a fantastic cardio workout. Beyond just the aerobic benefit, rowing machines can also help people lose weight, increase stamina, strengthen muscles and bolster their immune system. At Home Fitness carries one of the best lines of rowing machines on the market: the WaterRower. WaterRower is the famous brand of rowing machines used by Orange Theory Fitness. With a wide variety of products and accessories, WaterRower has established itself as a worldwide top choice for water rowing machines. You can find your WaterRower in Arizona at our local Phoenix retail stores or purchase online and At Home Fitness will ship to you anywhere in the USA. Whether you are after a high-intensity sweat or a soothing rowing session, the WaterRower offers an unrivaled, total-body exercise for users of all fitness levels. The WaterRower experience boosts a patented WaterFlyWheel which provides natural, smooth flowing resistance with the inspiring on-water sound that just cannot be found from traditional air or magnetic rowers. At Home Fitness offers a complete line of WaterRower products and accessories, including the Xeno Muller Signature Series with the S4 Monitor and the GX Studio with Quickstart Monitor. Stop into At Home Fitness and try out a WaterRower. It will take you to a new level of enjoyment when it comes to working out and can improve your overall fitness level. With easy to adjust resistance level controls, the WaterRower machine is so fun and challenging that you might almost forget you’re working out. Get into the rhythm of rowing at a good pace and the calories will melt off, your muscles will get toned and your cardio health can improve over time. At Home fitness is the best place in Arizona to purchase a WaterRower. Stop into one of our superstores and try one out today.